Taking a needed rest day in Marathon, Texas (a filming location for Wim Wender’s Paris, Texas – thus the title). It’s been a fun and strenuous few days moving out of scrub and caliche into high desert and mixed sandstone and caliche with real mountains on the horizon. One of the things I’ve been thinking about while riding has been the past and the future of the land I’m riding through. I’ll save future for another day – too depressing – but imagining Pleisto-scenery has been a lot of fun. Two things have been big inspirations: all the vultures, black and turkey, eating road kill, and the rock shelters at Seminole Canyon. The vultures make me think of their big cousin, the California Condor and the tar pit illustration on the cover of Brooks’ Mythical Man Month. I’d really like to see something huge sitting on one of the roadside deer or calves. And another variety of road kill, armadillo, brings to mind an all time favorite: glyptodonts. 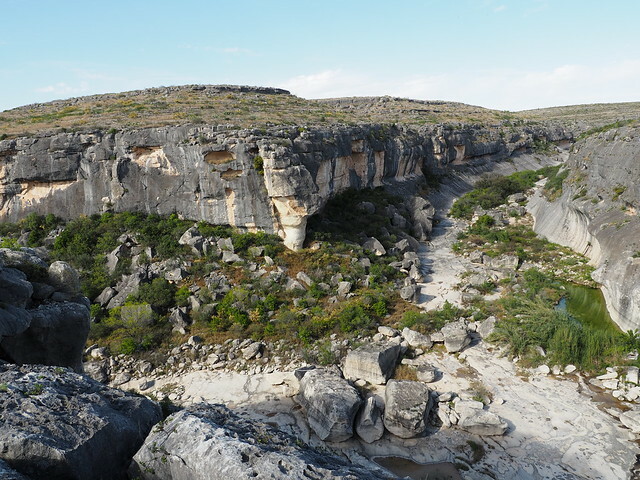 The environment in and around Seminole Canyon reminded me a lot of the Dawn of Man sequence from 2001 – again tossing me back in time. So along I rode, imagining family groups of glyptodonts, herds of the extinct pronghorn, Tetrameryx shuleri, stalked by American cheetahs, all watched over by soaring condors. Proper! Travelogue below fold, as usual. The 18th had the longest no-support-available stretch of the trip so far. From Langtry (of Judge Roy Bean and Lillie Langtry fame) to Sanderson, roughly 70 miles, there’s nothing. Especially no water. Not a surprise, and I had enough water on board to see me through an overnight if I was careful. I started off thinking that I’d just ride and see how things went, but I realized early on that I had a tailwind. 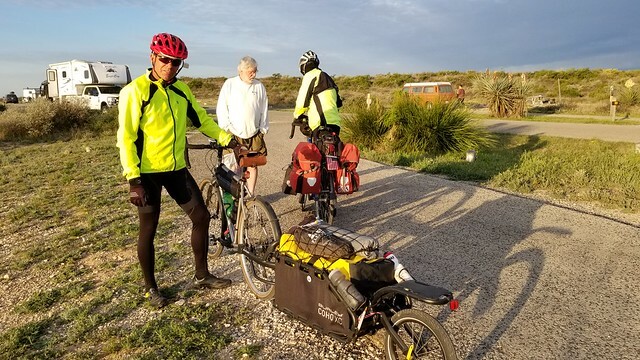 Slight tangent – the ‘normal’ way to ride across the map is west to east, because of the prevailing winds. I’ve been ridiculously lucky in having the wind at my back, blowing the wrong way, for a bunch of my ride. This fact has been pointed out by every single eastbound rider I’ve met *grin*. I’ve yet to encounter a nut riding the same direction I am. When I got to the highway sign that said I was 20 miles from Sanderson at about 4:30, I knew I had it. 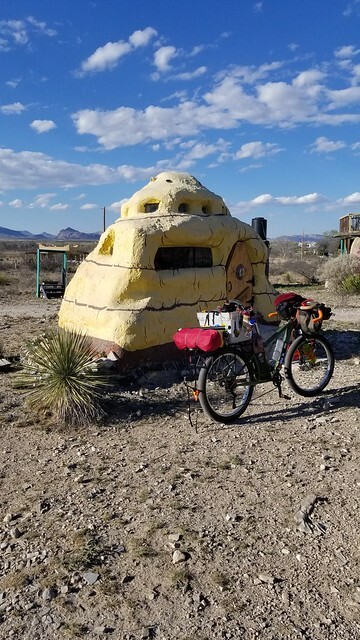 I also knew I had no interest in finding a campsite, getting set up, cooking, &c. Out came the cell phone and I booked a room at the Budget Inn. Very reasonably priced, they’re familiar with cyclists and the proprietor made me an amazing cup of masala chai in the morning. But before I pulled into Sanderson, one very cool experience. I’m zipping along and instantly the air is full of flying insects. Whaaa? Holy crap, bees! I’m in the middle of a northbound swarm who are crossing I90! I had a moment of fear – what if these bees are Africanized? – before reminding myself that swarms are pretty chill. And then, a quarter mile later, it happened again! I suppose it could have been two forks of the same swarm, but I prefer to believe that there’s a very productive hive in west Texas, regularly spinning off new colonies. Tally for Monday: 81 miles/4381 feet of climbing. I decided that one more decent day in the saddle would be plenty and that I’d take a rest day once I reached Marathon. A long day of steady climbing out of Sanderson Canyon led to a flat section into Marathon. A long day because my legs were not so fresh *grin*, it was a lot of gentle uphill, and because I topped out at 4200 feet above sea level. Not super high, but I realized that the altitude was having an effect on me. No matter, just keep spinning the cranks. I got my first view of real mountains in front of me as I came out of the canyon – exciting! I’d booked a spot at a hostel first thing Tuesday morning: La Loma del Chivo, an assemblage of marvelously funky structures on the south side of Marathon. Ingrid put me in the Beehive and when I got inside, I discovered a book on Exotic Marine Fishes and The Peregrine Falcon by Robert Murphy. ¯\_(? )_/¯ Kismet! 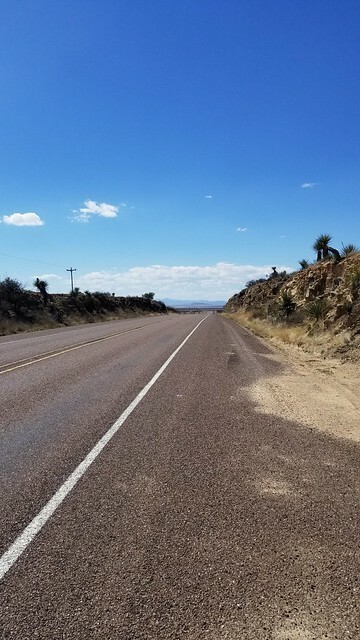 A good night’s sleep, and today has been all about laundry, route planning (I think Ill drop south from Marathon into Big Bend NP) and, next, grocery shopping. Saw you mentioned in Bruce and Robert’s Southern Tier Blog (crazy guy on a bike). Looks like you crossed paths near Brackettville? I did the southern tier myself a couple years ago, but didn’t get such good pictures of the local flora as you. I noticed that he posted a link to your blog as http://www.hawkdog.net/wordpress, which doesn’t work. hawkdog.net/wordpress does work. Just a suggestion, you may wish to update your DNS server to also respond to http://www.hawkdog.net, to avoid getting 404 errors. Feel free to delete this comment, it was just a convenient way to notify you. Thanks twice over – I’ll update my DNS entries next rest day, and thank you for the Bruce and Robert call-out. I have their card but it was buried across town in a pannier when I was writing the post. I’ll circle back and link them in properly.